Minerals account for almost half of Mongolia's gross domestic product, making extractive sector oversight an important function of the country's government. In recent years, the Natural Resource Governance Institute (NRGI) has worked with Mongolia's leaders to improve transparency in the mining industry and better harness national revenues from copper, gold, coal and other minerals. That effort continued in March at an NRGI workshop on contract analysis and monitoring with the State Great Hural, or house of parliament, in Ulan Bator, Mongolia's capital. The three-day workshop focused on parliamentary staff, drawing more than 40 key advisors and researchers from various relevant committees. 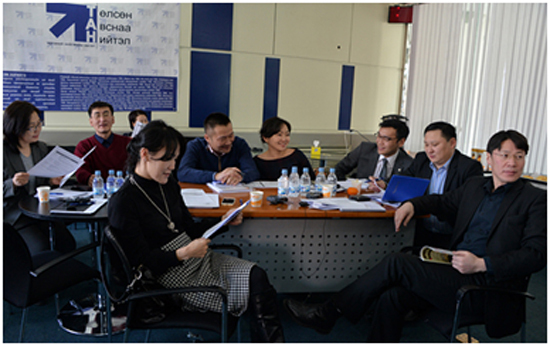 At a March workshop organized by NRGI and hosted by the Open Society Foundations, parliamentary staff in Mongolia worked on an exercise regarding contract monitoring. NRGI's senior legal analyst Amir Shafaie and Mongolia manager Dorjdari Namkhaijantsan delivered sessions exploring the role of contracts within the legal framework, contract content and key terminology, and methods for analyzing and monitoring different types of legal obligations. These skills are particularly relevant for parliamentary staff in Mongolia because parliament has played an important role on multibillion dollar mining contracts in the sector such as the Oyu Tolgoi and Tavan Tolgoi projects. Participants evaluated the workshop highly, praising its well-organized exercise sessions linking learned skills to practice. They represent a growing cohort of public and private sector leaders working to improve resource governance in Mongolia and transform the country's riches for development, despite recent economic setbacks linked with falling commodity prices and other challenges. Altan-Och Genden, principle officer at the Parliament Research Centre, said the training was directly relevant to his day-to-day work. “Parliamentarians often ask us to evaluate the terms of mining contracts and so the content and discussions will be helpful to our continued work in this area,” he said. To learn more about Mongolia's governance landscape, see the 2013 Resource Governance Index. Fidan Bagirova is NRGI's Eurasia senior officer.